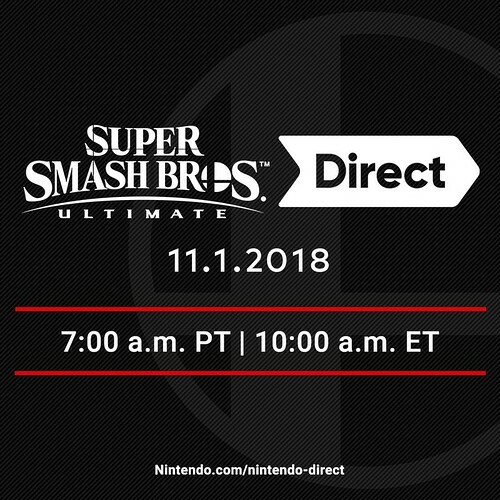 Tune in 11/1 for roughly 40 minutes of new information in the final Super #SmashBrosUltimate #NintendoDirect before the game’s release, hosted by Director Masahiro Sakurai! The Direct will be followed by a post-show Nintendo Treehouse: Live presentation. I like Nintendo and a lot of the Smash games have wound up in my house but I never quite got the series. It's fun but I don't think it's great. I've always loved the Smash series...but I'm not sure how much mileage I'll end up getting out of this one. I was in high school when the first two came out (freshman year and senior year, respectively) and games like Smash always got a lot of playtime. My group of friends had begun the natural splintering process by 2008 when Brawl came out for the Wii...so it didn't get nearly as much activity as Melee did. I skipped the Wii U version entirely because I didn't have the console, but the six years in between hadn't helped the cause much. I'm excited for Ultimate, but it's going to essentially be a game I play by myself (with maybe some dabbling online...but I doubt it) unless I venture out to one of the pubs that hosts a weekly event run by a state-wide fighting game group. This series has gone from something that used to be pretty competitive amongst my group of friends to something I'll kill some time with on the couch by myself. Kinda makes me sad, in a way. I know it'll probably end up as a day one purchase for me...but I have a feeling a lot of the magic will be gone, through no fault of the game or anyone involved with its development. Well what you're describing is the sad decline of gaming with other people on the couch. I very much miss it though my boys are getting old enough that it's starting to make a bit of a comeback in my house. Online is fun but it can't compete.